Apple on Monday offered attendees at its annual developer conference an overview of its nearly finalized Mac OS X 10.6 Snow Leopard operating system, which the company said will be available in September as a $29 upgrade for users of Mac OS X 10.5 Leopard. 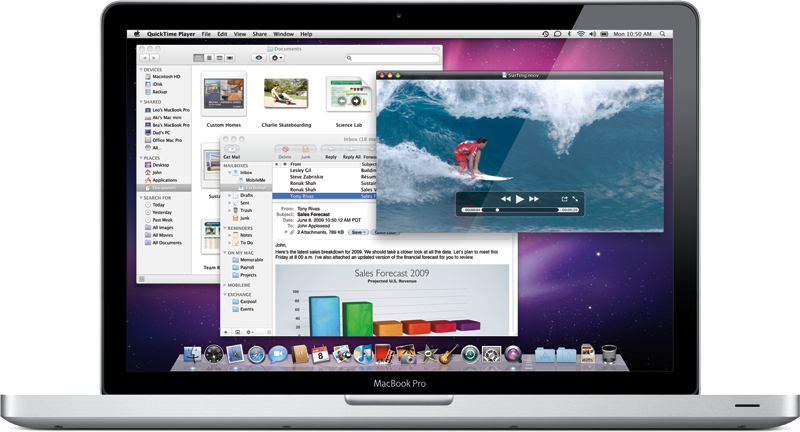 —Snow Leopard also includes an all new QuickTime X, with a redesigned player that allows users to easily view, record, trim and share video to YouTube, MobileMe or iTunes. —Snow Leopard is half the size of the previous version and frees up to 6GB of drive space once installed. For the first time, Apple said system applications including Finder, Mail, iCal, iChat and Safari are 64-bit and Snow Leopard's support for 64-bit processors makes use of large amounts of RAM, increases performance, and improves security while remaining compatible with 32-bit applications. Meanwhile, Grand Central Dispatch (GCD) provides a new way for software to take advantage of multicore processors. GCD is integrated throughout Snow Leopard, from new system-wide APIs to high-level frameworks and programming language extensions, improving responsiveness across the system. OpenCL, a C-based open standard, allows developers to tap the incredible power of the graphics processing unit for tasks that go beyond graphics. Snow Leopard also builds support for Microsoft Exchange Server 2007 right into Mac OS X Mail, Address Book and iCal so you can use these applications to send and receive email, create and respond to meeting invitations, and search and manage your contacts with global address lists. Exchange information works seamlessly within Snow Leopard so users can take advantage of OS X only features such as fast Spotlight searches and Quick Look previews. 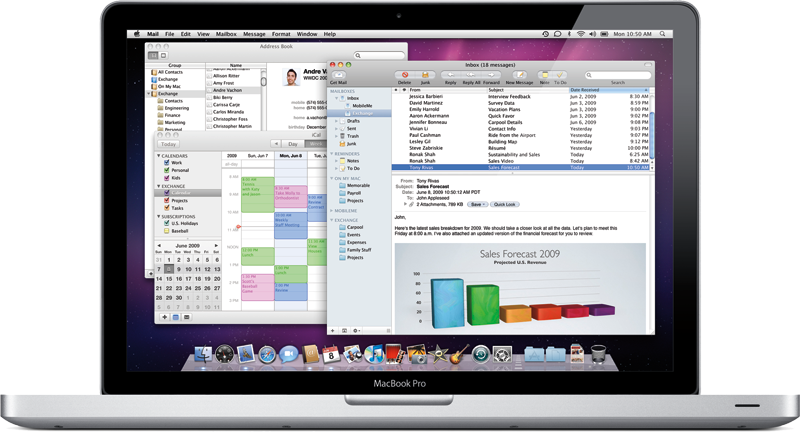 Snow Leopard is the only desktop operating system with out of the box support for Exchange 2007 and businesses of any size will find it easier to integrate Macs into their organization. Every Mac includes features and technologies for users with special needs, and Snow Leopard also adds new features that make the Mac experience even more accessible to those with a vision impairment. Apple's Multi-Touch trackpad is now integrated with the VoiceOver screen reader so users can hear and navigate different parts of a window or the desktop by moving a single finger around the trackpad as if it were the screen. Snow Leopard also introduces built-in support for wireless bluetooth braille displays and the connection of multiple braille displays simultaneously to one Mac. Mac OS X version 10.6 Snow Leopard will be available as an upgrade to Mac OS X version 10.5 Leopard in September 2009 through the Apple Store, Apple's retail stores and Apple Authorized Resellers. The Snow Leopard single user license will be available for a suggested retail price of $29 (US) and the Snow Leopard Family Pack, a single household, five-user license, will be available for a suggested price of $49 (US). For Tiger users with an Intel-based Mac, the Mac Box Set includes Mac OS X Snow Leopard, iLife '09 and iWork '09 and will be available for a suggested price of $169 (US) and a Family Pack is available for a suggested price of $229 (US). Snow Leopard requires a minimum of 1GB of RAM and is designed to run on any Mac computer with an Intel processor. Full system requirements can be found here.